Earlier today, someone I know shared a video on Facebook. The video is just a text slide show, retelling a story that, according to snopes.com, has been around for almost a century. Condensed version: an atheist university professor keeps ridiculing religion year after year in his class, “demonstrating” that God does not exist by dropping a piece of chalk, which shatters into pieces as God fails to intervene. 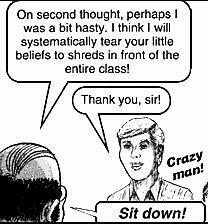 When finally, just as a young man stands up to him, the demonstration fails (the chalk slips from the professor’s fingers and does not break), the humiliated professor flees the classroom, leaving the young man sharing his faith in Jesus with his fellow students for the next half hour. The video version then laments on people’s lack of faith and how everyone wants to go to heaven but so few are willing to do what it takes. I felt compelled to reply to the post of my Facebook friend. I told him that as a committed atheist, I would call the professor of this story a much bigger fool than he thought his religious students were. He basically turned his atheism into a matter of faith… a religion, in other words, with himself the firebrand preacher. The morale of the story is that if there had been true believers in that classroom, and I mean true believers, not just timid, half-committed people practicing a form of Pascal’s Wager in the vain hope for a better chance in the afterlife, one of them would have stood up and caught the chalk long ago. And then, perhaps even the half-hour sermon would not have been necessary afterwards to convince others of the purity and depth of his faith. And yes, I am a committed atheist. It does not stop me from respecting, even defending other people’s right to their faith, though I have no use for it. And no, everyone does not want to go to heaven. I have no need for an imaginary kindergarten afterlife. I just want to make the most of this one life here on Earth, as a decent (I hope) human being. Which includes not ridiculing others for their faith, even if I myself find the subject of that faith somewhat ridiculous.